Washing your dog at home can mean puddles everywhere, flying fur and mounds of laundry. 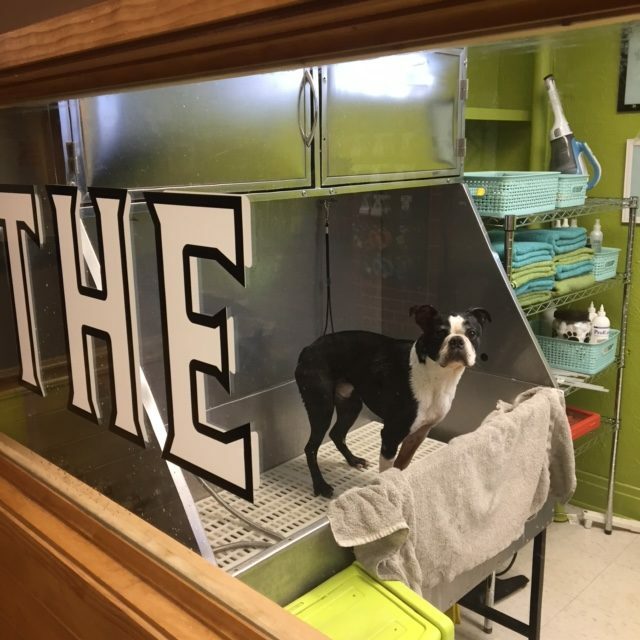 Avoid the mess and reduce the stress at K9 Connections Self Service Dog Wash, The Tub – an easy and convenient place to clean your dog. This is no ordinary tub, but it’s so much more. For larger dogs, there are steps leading up into the waist-high tub make it comfortable for both you and your pet. In addition to built in restraining leashes, we have comfortable grate flooring to keep paws out of the dirty water. Towels, aprons, rubber scrubber, brushes (Furminator!) and combs. Ear cleaning supplies, nail trimmers, and grooming sprays. 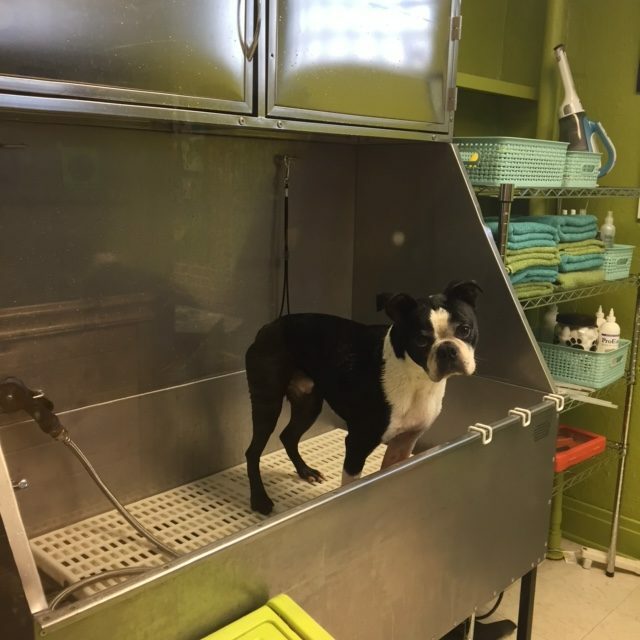 Waist-high tub, temperature controlled water, kennel dryers, and grooming table. Your choice of shampoo’s and conditioners, or bring your own or veterinary prescribed medicated shampoo. K9 Connection requires all pets entering our facilities to be up to date on vaccinations. Proof of vaccinations must be on file prior to scheduling your first appointment. Required vaccines are Rabies, Canine Distemper and Parvo (titers accepted) and Bordetella, commonly known as Kennel Cough or Intratac. All dogs must be on a 6-foot or shorter leash or in carriers at all timescontrol of an adult. Pets must never be left unattended while in our facilities. For the safety of all our clients, disruptive and/or aggressive dogs may be asked to leave, at management’s discretion. Talk to a manager to discuss options for using services that may be better suited for your pets special needs. Children 16 years old and younger must be attended by and under the supervision of a parent or responsible adult at all times. Last wash is ½ hour before closing. The Tub is open during our normal office hours: Monday through Friday 12:00pm- 6:00pm, and Saturday 9:00am- 2:00pm, last wash is ½ hour before closing. If you need to schedule a wash time outside of these hours, please indicate that within your contact form and we will do our best to accommodate you. Wash times are based on time, and services you choose to preform. The time is yours to do whatever you need. Want 30 minutes to brush the undercoat out? Done. Quick 10 minute bath after daycare? Cool. Fluffy dog that needs time to dry for 15 minutes after a bath? That works! 10 minutes of Tub time – $10 Ideal for quick cleans or more intense cleaning for small or short coated dogs. 15 minutes of Tub time – $20 Recommended if you need to spend some time brushing before you bathe, or want some time to dry in the kennel. 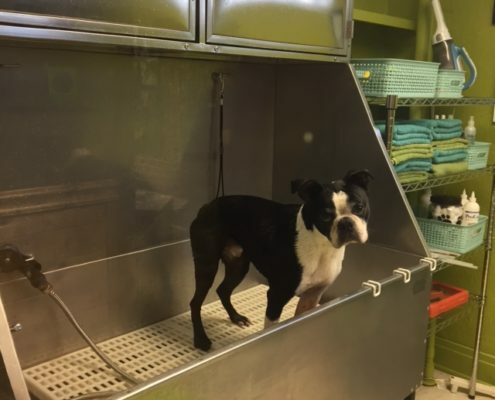 20 minutes of Tub time – $30 Great for larger dogs, or dogs that require more grooming before and after their bath. Prices include all supplies needed for bathing, shampoo, towels, tub and the space to do it! 1. I agree that I have hired K9 Connection, as training professionals, to determine which tools are necessary to help me train my dog. I understand that I will obtain the best training results by following the instructions of the K9 Connection trainer(s). I further understand that I am solely responsible for the training of my dog. 2. I certify that my dog is in good health, is free from fleas, ticks, heartworms, and all other parasites, and has received all required vaccinations, including: canine distemper, parvo virus, hepatitis, parainfluenza, bordetella, and rabies. I agree that I am under a continuing obligation to report to K9 Connection any signs of illness or infection in my dog. 3. In the event that my dog requires emergency veterinary treatment while attending a Boot Camp program, I agree that K9 Connection, in its sole discretion, will transport my dog to an appropriate veterinary facility for treatment and will immediately attempt to contact me. I assume all financial responsibility for veterinary treatment. 4. 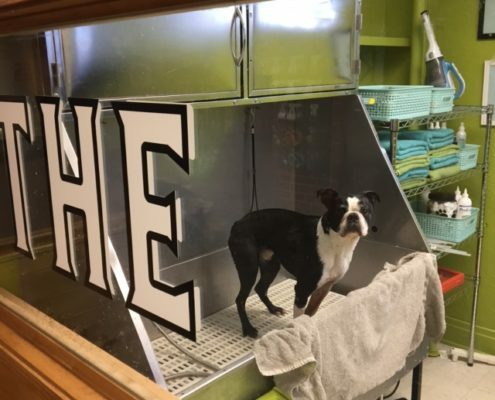 K9 Connection strives to keep a clean and sanitary environment. I understand that even in cleanest environments, infections, diseases, and parasites may be transmitted between animals. 5. I understand and agree that if attending boot camp or day training, my dog may be placed in a kennel for periods of time during the day and/or night to allow for rest and downtime. 7. I understand that my account must be paid in full prior to or at the first training session, and that there will be no refunds. K9 Connection reserves the right to change rates over time. 8. I understand that any remaining balance or unused training will expire one year after day of purchase. 9. I understand that in order to receive a refund for my deposit I must cancel two-weeks (fourteen days) prior to the start of my program. I understand that cancelations or rescheduling beyond the two-week period will result in my deposit to become non-refundable and non-transferable. Refunds will be credited back in the original form of payment. To cancel or reschedule an appointment please contact our office directly to speak with a representative. 10. I understand that if I must cancel or reschedule an appointment, I must provide 24 hours advance notice. Failure to do so will result in forfeiture of that lesson. 11. I understand that I am responsible for reading any literature provided by K9 Connection or by the manufacturers of any products used in my dog’s training. 12. I agree that training collars will not be left on my dog overnight or while my dog is unattended. 13. Missed group classes cannot be made up without express consent from management. Group class membership weeks begin on Monday and end on Sunday. Group class membership fees are determined based on the average number of classes per month, taking into consideration closings for holidays, seminars, etc… K9 Connection reserves the right to remove anyone from group classes, for any reason. 14. I understand that although K9 Connection has successfully trained many aggressive dogs, there are no guarantees that aggression will completely recede with training. I agree that if my dog has displayed or continues to display aggression toward other dogs and/or people, it is my responsibility to muzzle my dog and to avoid potential problem situations at all times, not solely during training sessions. 15. I agree that in the event my dog engages in an act of aggression toward another dog or person while participating in dog training, K9 Connection staff may, in their sole discretion, use reasonable physical force to interrupt and stop the aggression. I further agree that I am solely responsible, financially or otherwise, for any harm or damage to other dogs, persons, and/or property arising out of my dog’s behavior. 16. I agree to allow K9 Connection to photograph and/or videotape my dog for use in print, publication, and promotion of K9 Connection. I understand that attendance and participation in K9 Connection dog training, daycare or boarding is not without risk to myself, to my dog(s), and/or to third parties, and/or the dog(s) of third parties. The risks include, but are not limited to, the risk of property damage, personal injury from dog bites, scratches, or other injuries, death, infectious disease, and parasites. I agree that my dog’s attendance and participation in K9 Connection dog training, daycare or boarding is voluntary and was undertaken with my knowledge of the known risks and other risks that may result from my dog’s participation dog training. I agree that I have been informed of the risks associated with dog training and have assumed the risk of my dog’s attendance and participation in K9 Connection dog training, daycare or boarding. In consideration for my dog’s attendance and participation in K9 Connection dog training, daycare, or boarding, I fully release K9 Connection from any and all claims and/or liability arising out of my dog’s attendance at, or participation in, dog training, including all claims for personal injury, wrongful death, and property damage. I agree to defend, indemnify, and hold harmless K9 Connection from any and all claims and costs, including attorney’s fees, arising out of or relating to my dog’s attendance at, or participation in, K9 Connection dog training, daycare or boarding, including claims of negligence against K9 Connection, it’s employees, officers, agents and/or volunteers. Look who’s been to The Tub…..